Yesterday Italian-Thai company workers were evacuated back to Thailand to escape fighting between Karen fighters and Burma army soldiers near their camp base. 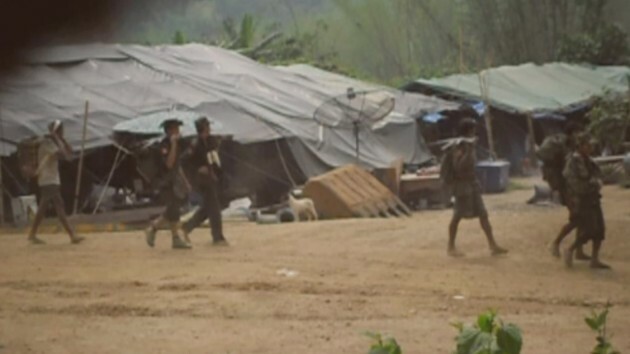 A Karen National Liberation Army source told Karen News, that on the morning of the 28 July KNLA fighter from Brigade 4 torched a temporary Burma Army camp on the Kanchanaburi-Tavoy highway. The Italian-Thai Company camp, known as Base 1, is close to the Burma army camp based at Ah Leh Sa Toe on the Thai-Burma border. Fierce fighting between a Burma army patrol and Karen soldiers unnerved the Italian-Thai workers. At least 50 of the company’s workers were evacuated to the Thai side of the border in Kanchanaburi. No company workers were killed or injured in the firefight, but according to villagers who also fled the fighting artillery shells hit their camp. A villager said after reaching safety in Thailand that about six Burma Army soldiers were killed. The Italian-Thai Development Company is constructing the Kanchanaburi-Tavoy Highway project was stopped by the KNLA in early July. The enforced stop was in retaliation after villagers complained to the Karen National Union that the project was having negative impacts on civilian populations and the environment. The Kanchanaburi-Tavoy highway is part of the mega Tavoy (Dawei) Development Project that was awarded by the Burmese military government to the Italian-Thai Company. The US$60 billion project includes a deep-sea port, a giant industrial zone, roads, railways, transmission lines and oil and gas pipelines.